ALEXANDRIA, VA, Sep. 08 /CSRwire/ - Today, Global Impact released a white paper titled “The Corporate Signature Program: A Custom Approach to Philanthropy.” This paper examines a growing best practice in corporate investments known as signature programs, a major investment by a company in a particular cause, issue or theme. A continuation of the original research performed by Global Impact and Indiana University in “Giving Beyond Borders: A Study of Global Giving by U.S. Corporations,” the corporate signature program white paper provides guidance on how to build and manage signature programs and gives examples of how some U.S. corporations built their own successful signature programs. 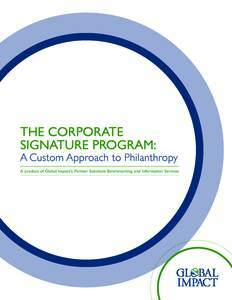 In particular, this white paper looks at why corporations invest in such programs, what companies seek to achieve through their giving, what steps to take to create a signature program, and what types of models can be used for program management. Also this week, Scott Jackson will be moderating a breakout session on the topic of the white paper at the Corporate Citizenship Center (CCC) annual corporate citizenship conference. Furthermore, Mr. Jackson will moderate a plenary session at the CCC event about where philanthropy meets social impact and host another breakout session about mobilizing corporate citizenship around a particular cause. Global Impact is a leader in growing global philanthropy. The organization builds partnerships and raises resources that help the world’s most vulnerable people by providing integrated, partner-specific advisory and secretariat services; campaign design, marketing and implementation for workplace and signature fundraising campaigns; and fiscal agency, technology services and integrated giving platforms. Global Impact works with approximately 450 public and private sector workplace giving campaigns to generate funding for an alliance of more than 120 international charities. Through strategic council and implementation support, Global Impact equips private sector and nonprofit organizations to achieve their philanthropic goals. The organization serves as administrator for one of the world’s largest workplace giving campaigns, the Combined Federal Campaign-Overseas. Since 1956, Global Impact has generated more than $1.6 billion to help the world’s most vulnerable people.